This article is about the moons of Jupiter. For other uses, see Moons of Jupiter (disambiguation). There are 79 known moons of Jupiter. This gives Jupiter the largest number of known moons with reasonably stable orbits of any planet in the Solar System, if one doesn't count the moonlets within Saturn's rings. The most massive of the moons are the four Galilean moons, which were independently discovered in 1610 by Galileo Galilei and Simon Marius and were the first objects found to orbit a body that was neither Earth nor the Sun. From the end of the 19th century, dozens of much smaller Jovian moons have been discovered and have received the names of lovers or daughters of the Roman god Jupiter or his Greek equivalent Zeus. The Galilean moons are by far the largest and most massive objects to orbit Jupiter, with the remaining 75 known moons and the rings together comprising just 0.003% of the total orbiting mass. The orbit and motion of the Galilean moons around Jupiter, as captured by JunoCam aboard the Juno spacecraft. Of Jupiter's moons, eight are regular satellites with prograde and nearly circular orbits that are not greatly inclined with respect to Jupiter's equatorial plane. The Galilean satellites are nearly spherical in shape due to their planetary mass, and so would be considered at least dwarf planets if they were in direct orbit around the Sun. The other four regular satellites are much smaller and closer to Jupiter; these serve as sources of the dust that makes up Jupiter's rings. The remainder of Jupiter's moons are irregular satellites whose prograde and retrograde orbits are much farther from Jupiter and have high inclinations and eccentricities. These moons were probably captured by Jupiter from solar orbits. Twenty-seven of the irregular satellites have not yet been officially named. The physical and orbital characteristics of the moons vary widely. The four Galileans are all over 3,100 kilometres (1,900 mi) in diameter; the largest Galilean, Ganymede, is the ninth largest object in the Solar System, after the Sun and seven of the planets, Ganymede being larger than Mercury. All other Jovian moons are less than 250 kilometres (160 mi) in diameter, with most barely exceeding 5 kilometres (3.1 mi). [note 1] Their orbital shapes range from nearly perfectly circular to highly eccentric and inclined, and many revolve in the direction opposite to Jupiter's spin (retrograde motion). Orbital periods range from seven hours (taking less time than Jupiter does to spin around its axis), to some three thousand times more (almost three Earth years). 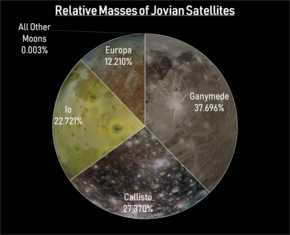 The relative masses of the Jovian moons. Those smaller than Europa are not visible at this scale, and combined would only be visible at 100× magnification. Jupiter's regular satellites are believed to have formed from a circumplanetary disk, a ring of accreting gas and solid debris analogous to a protoplanetary disk. They may be the remnants of a score of Galilean-mass satellites that formed early in Jupiter's history. Simulations suggest that, while the disk had a relatively high mass at any given moment, over time a substantial fraction (several tenths of a percent) of the mass of Jupiter captured from the solar nebula was passed through it. However, only 2% of the proto-disk mass of Jupiter is required to explain the existing satellites. Thus there may have been several generations of Galilean-mass satellites in Jupiter's early history. Each generation of moons might have spiraled into Jupiter, because of drag from the disk, with new moons then forming from the new debris captured from the solar nebula. By the time the present (possibly fifth) generation formed, the disk had thinned so that it no longer greatly interfered with the moons' orbits. The current Galilean moons were still affected, falling into and being partially protected by an orbital resonance with each other, which still exists for Io, Europa, and Ganymede. Ganymede's larger mass means that it would have migrated inward at a faster rate than Europa or Io. The outer, irregular moons are thought to have originated from captured asteroids, whereas the protolunar disk was still massive enough to absorb much of their momentum and thus capture them into orbit. Many are believed to have broken up by mechanical stresses during capture, or afterward by collisions with other small bodies, producing the moons we see today. The Galilean moons. From left to right, in order of increasing distance from Jupiter: Io; Europa; Ganymede; Callisto. Some scholars propose that the earliest record of a Jovian moon (Ganymede or Callisto) is a note by Chinese astronomer Gan De of an observation around 364 BC. However, the first certain observations of Jupiter's satellites were those of Galileo Galilei in 1609. By January 1610, he had sighted the four massive Galilean moons with his 30× magnification telescope, and he published his results in March 1610. Simon Marius had independently discovered the moons one day after Galileo, although he did not publish his book on the subject until 1614. Even so, the names Marius assigned are used today: Ganymede; Callisto; Io; and Europa. No additional satellites were discovered until E. E. Barnard observed Amalthea in 1892. With the aid of telescopic photography, further discoveries followed quickly over the course of the 20th century. Himalia was discovered in 1904, Elara in 1905, Pasiphae in 1908, Sinope in 1914, Lysithea and Carme in 1938, Ananke in 1951, and Leda in 1974. Jupiter and the Galilean moons through a 25 cm (10 in) Meade LX200 telescope. By the time that the Voyager space probes reached Jupiter, around 1979, 13 moons had been discovered, not including Themisto, which had been observed in 1975, but was lost until 2000 due to insufficient initial observation data. The Voyager spacecraft discovered an additional three inner moons in 1979: Metis; Adrastea; and Thebe. No additional moons were discovered for two decades, generally during the 1980s and 1990s, but between October 1999 and February 2003, researchers found another 34 moons using sensitive ground-based detectors. These are tiny moons, in long, eccentric, generally retrograde orbits, and averaging 3 km (1.9 mi) in diameter, with the largest being just 9 km (5.6 mi) across. All of these moons are thought to have been captured asteroidal or perhaps comet bodies, possibly fragmented into several pieces. By 2015, a total of 15 additional moons were discovered. Two more were discovered in 2016 by the team led by Scott S. Sheppard at the Carnegie Institution for Science, bringing the total to 69. On 17 July 2018, the International Astronomical Union confirmed that Sheppard's team discovered ten more moons around Jupiter, bringing the total number to 79. Among these is Valetudo, which has a prograde orbit, but crosses paths with several moons that have retrograde orbits, making an eventual collision—at some point on a billions of years timescale—likely. Additional tiny moons likely exist but remain undiscovered, as they are very difficult for astronomers to detect. The number of moons known for each of the four outer planets up to July 2018. Jupiter currently has 79 known satellites. The Galilean moons and their orbits around Jupiter. The Galilean moons of Jupiter (Io, Europa, Ganymede, and Callisto) were named by Simon Marius soon after their discovery in 1610. However, these names fell out of favor until the 20th century. The astronomical literature instead simply referred to "Jupiter I", "Jupiter II", etc., or "the first satellite of Jupiter", "Jupiter's second satellite", and so on. The names Io, Europa, Ganymede, and Callisto became popular in the mid-20th century, whereas the rest of the moons remained unnamed and were usually numbered in Roman numerals V (5) to XII (12). [better source needed] Jupiter V was discovered in 1892 and given the name Amalthea by a popular though unofficial convention, a name first used by French astronomer Camille Flammarion. The other moons were simply labeled by their Roman numeral (e.g. Jupiter IX) in the majority of astronomical literature until the 1970s. In 1975, the International Astronomical Union's (IAU) Task Group for Outer Solar System Nomenclature granted names to satellites V–XIII, and provided for a formal naming process for future satellites still to be discovered. The practice was to name newly discovered moons of Jupiter after lovers and favorites of the god Jupiter (Zeus) and, since 2004, also after their descendants. All of Jupiter's satellites from XXXIV (Euporie) onward are named after daughters of Jupiter or Zeus, except LIII (Dia), named after a lover of Jupiter, and LXII (Valetudo), named after a great-granddaughter of Jupiter. Names ending with "a" or "o" are used for prograde irregular satellites (the latter for highly inclined satellites), and names ending with "e" are used for retrograde irregulars. The most recently confirmed moons Jupiter LI through LXXII (with the exception of Jupiter LIII Dia and Jupiter LXII Valetudo) have not received names. Some asteroids share the same names as moons of Jupiter: 9 Metis, 38 Leda, 52 Europa, 85 Io, 113 Amalthea, 239 Adrastea. Two more asteroids previously shared the names of Jovian moons until spelling differences were made permanent by the IAU: Ganymede and asteroid 1036 Ganymed; and Callisto and asteroid 204 Kallisto. The orbits of Jupiter's irregular satellites, and how they cluster into groups: by semi-major axis (the horizontal axis in Gm); by orbital inclination (the vertical axis); and orbital eccentricity (the yellow lines). The relative sizes are indicated by the circles. Inner satellites or Amalthea group: Metis, Adrastea, Amalthea, and Thebe. These orbit very close to Jupiter; the innermost two orbit in less than a Jovian day. The latter two are respectively the fifth and seventh largest moons in the Jovian system. Observations suggest that at least the largest member, Amalthea, did not form on its present orbit, but farther from the planet, or that it is a captured Solar System body. These moons, along with a number of as-yet-unseen inner moonlets, replenish and maintain Jupiter's faint ring system. Metis and Adrastea help to maintain Jupiter's main ring, whereas Amalthea and Thebe each maintain their own faint outer rings. Main group or Galilean moons: Io, Europa, Ganymede and Callisto. They are some of the largest objects in the Solar System outside the Sun and the eight planets in terms of mass and are larger than any known dwarf planet. Ganymede exceeds even the planet Mercury in diameter. They are respectively the fourth-, sixth-, first-, and third-largest natural satellites in the Solar System, containing approximately 99.997% of the total mass in orbit around Jupiter, while Jupiter is almost 5,000 times more massive than the Galilean moons. [note 2] The inner moons are in a 1:2:4 orbital resonance. Models suggest that they formed by slow accretion in the low-density Jovian subnebula—a disc of the gas and dust that existed around Jupiter after its formation—which lasted up to 10 million years in the case of Callisto. Several are suspected of having subsurface oceans. Themisto is the innermost irregular moon and is not part of a known family. The Himalia group is spread over barely 1.4 Gm in semi-major axes, 1.6° in inclination (27.5 ± 0.8°), and eccentricities between 0.11 and 0.25. It has been suggested that the group could be a remnant of the break-up of an asteroid from the asteroid belt. Carpo is another prograde moon and is not part of a known family. It has the highest inclination of all of the prograde moons. Valetudo, reported 2018, is the outermost prograde moon and is not part of a known family. It has a prograde orbit, but it crosses paths with several moons that have retrograde orbits and may in the future collide with them. Retrograde satellites: inclinations (°) vs. eccentricities, with Carme's (orange) and Ananke's (yellow) groups identified. Data as of 2009. The Carme group is spread over only 1.2 Gm in semi-major axis, 1.6° in inclination (165.7 ± 0.8°), and eccentricities between 0.23 and 0.27. It is very homogeneous in color (light red) and is believed to have originated from a D-type asteroid progenitor, possibly a Jupiter Trojan. The Ananke group has a relatively wider spread than the previous groups, over 2.4 Gm in semi-major axis, 8.1° in inclination (between 145.7° and 154.8°), and eccentricities between 0.02 and 0.28. Most of the members appear gray, and are believed to have formed from the breakup of a captured asteroid. The Pasiphae group is quite dispersed, with a spread over 1.3 Gm, inclinations between 144.5° and 158.3°, and eccentricities between 0.25 and 0.43. The colors also vary significantly, from red to grey, which might be the result of multiple collisions. Sinope, sometimes included in the Pasiphae group, is red and, given the difference in inclination, it could have been captured independently; Pasiphae and Sinope are also trapped in secular resonances with Jupiter. The moons of Jupiter are listed below by orbital period. Moons massive enough for their surfaces to have collapsed into a spheroid are highlighted in bold. These are the four Galilean moons, which are comparable in size to the Moon. The other moons are much smaller, with the least massive Galilean moon being more than 7000 times more massive than the most massive of the other moons. The irregular captured moons are shaded light gray when prograde and dark gray when retrograde. All orbits are based on the estimated orbit on the Julian date 2457000, or 3 September 2017. As several moons of Jupiter are currently lost, these orbital elements may be only rough approximations. As of 2018, seven satellites are considered to be lost. These are S/2003 J 2, S/2003 J 4, S/2003 J 9, S/2003 J 10, S/2003 J 12, S/2003 J 16, and S/2003 J 23. A number of other moons have only been observed for a year or two, but have decent enough orbits to be easily measurable even in 2018. The first spacecraft to visit Jupiter were Pioneer 10 in 1973, and Pioneer 11 a year later, taking low-resolution images of the four Galilean moons. The Voyager 1 and Voyager 2 probes visited Jupiter in 1979, discovering the volcanic activity on Io and the presence of water ice on the surface of Europa. The Cassini probe to Saturn flew by Jupiter in 2000 and collected data on interactions of the Galilean moons with Jupiter's extended atmosphere. The New Horizons spacecraft flew by Jupiter in 2007 and made improved measurements of its satellites' orbital parameters. The Galileo spacecraft was the first to enter orbit around Jupiter, arriving in 1995 and studying it until 2003. During this period, Galileo gathered a large amount of information about the Jovian system, making close approaches to all of the Galilean moons and finding evidence for thin atmospheres on three of them, as well as the possibility of liquid water beneath the surfaces of Europa, Ganymede, and Callisto. It also discovered a magnetic field around Ganymede. In 2016, the Juno spacecraft imaged the Galilean moons from above their orbital plane as it approached Jupiter orbit insertion, creating a time-lapse movie of their motion. ^ Order refers to the position among other moons with respect to their average distance from Jupiter. ^ Label refers to the Roman numeral attributed to each moon in order of their naming. ^ Diameters with multiple entries such as "60 × 40 × 34" reflect that the body is not a perfect spheroid and that each of its dimensions have been measured well enough. ^ Periods with negative values are retrograde. ^ "?" refers to group assignments that are not considered sure yet. ^ Sheppard, Scott S. "The Jupiter Satellite and Moon Page". Carnegie Institution, Department of Terrestrial Magnetism. Retrieved 17 July 2018. ^ Resnick, Brian. "The Jupiter Satellite and Moon Page". Vox. Retrieved 17 July 2018. ^ Science, Carnegie (16 July 2018). "A dozen new moons of Jupiter discovered, including one "oddball"". Carnegie Institution for Science. Retrieved 17 July 2018. ^ a b "12 New Moons Found Orbiting Jupiter". 17 July 2018. Retrieved 17 July 2018. ^ a b c d e Canup, Robert M.; Ward, William R. (2009). "Origin of Europa and the Galilean Satellites". Europa. University of Arizona Press (in press). arXiv:0812.4995. Bibcode:2009euro.book...59C. ^ Alibert, Y.; Mousis, O.; Benz, W. (2005). "Modeling the Jovian subnebula I. Thermodynamic conditions and migration of proto-satellites". Astronomy & Astrophysics. 439 (3): 1205–13. arXiv:astro-ph/0505367. Bibcode:2005A&A...439.1205A. doi:10.1051/0004-6361:20052841. ^ a b Chown, Marcus (7 March 2009). "Cannibalistic Jupiter ate its early moons". New Scientist. Retrieved 18 March 2009. ^ Jewitt, David; Haghighipour, Nader (2007). "Irregular Satellites of the Planets: Products of Capture in the Early Solar System" (PDF). Annual Review of Astronomy and Astrophysics. 45 (1): 261–95. arXiv:astro-ph/0703059. Bibcode:2007ARA&A..45..261J. doi:10.1146/annurev.astro.44.051905.092459. Archived from the original (PDF) on 7 February 2010. ^ Xi, Zezong Z. (February 1981). "The Discovery of Jupiter's Satellite Made by Gan De 2000 years Before Galileo". Acta Astrophysica Sinica. 1 (2): 87. Bibcode:1981AcApS...1...85X. ^ Galilei, Galileo (1989). Translated and prefaced by Albert Van Helden (ed.). Sidereus Nuncius. Chicago & London: University of Chicago Press. pp. 14–16. ISBN 0-226-27903-0. ^ Van Helden, Albert (March 1974). "The Telescope in the Seventeenth Century". Isis. The University of Chicago Press on behalf of The History of Science Society. 65 (1): 38–58. doi:10.1086/351216. ^ Barnard, E. E. (1892). "Discovery and Observation of a Fifth Satellite to Jupiter". Astronomical Journal. 12: 81–85. Bibcode:1892AJ.....12...81B. doi:10.1086/101715. ^ Barnard, E. E. (9 January 1905). "Discovery of a Sixth Satellite of Jupiter". Astronomical Journal. 24 (18): 154B, . Bibcode:1905AJ.....24S.154.. doi:10.1086/103654. ^ Perrine, C. D. (1905). "The Seventh Satellite of Jupiter". Publications of the Astronomical Society of the Pacific. 17 (101): 62–63. Bibcode:1905PASP...17...56.. doi:10.1086/121624. JSTOR 40691209. ^ Melotte, P. J. (1908). "Note on the Newly Discovered Eighth Satellite of Jupiter, Photographed at the Royal Observatory, Greenwich". Monthly Notices of the Royal Astronomical Society. 68 (6): 456–457. Bibcode:1908MNRAS..68..456.. doi:10.1093/mnras/68.6.456. ^ Nicholson, S. B. (1914). "Discovery of the Ninth Satellite of Jupiter". Publications of the Astronomical Society of the Pacific. 26: 197–198. Bibcode:1914PASP...26..197N. doi:10.1086/122336. PMC 1090718. ^ Nicholson, S.B. (1938). "Two New Satellites of Jupiter". Publications of the Astronomical Society of the Pacific. 50: 292–293. Bibcode:1938PASP...50..292N. doi:10.1086/124963. ^ Nicholson, S. B. (1951). "An unidentified object near Jupiter, probably a new satellite". Publications of the Astronomical Society of the Pacific. 63 (375): 297–299. Bibcode:1951PASP...63..297N. doi:10.1086/126402. ^ Kowal, C. T.; Aksnes, K.; Marsden, B. G.; Roemer, E. (1974). "Thirteenth satellite of Jupiter". Astronomical Journal. 80: 460–464. Bibcode:1975AJ.....80..460K. doi:10.1086/111766. ^ Marsden, Brian G. (3 October 1975). "Probable New Satellite of Jupiter" (discovery telegram sent to the IAU). IAU Circular. Cambridge, US: Smithsonian Astrophysical Observatory. 2845. Retrieved 8 January 2011. ^ Synnott, S.P. (1980). "1979J2: The Discovery of a Previously Unknown Jovian Satellite". Science. 210 (4471): 786–788. Bibcode:1980Sci...210..786S. doi:10.1126/science.210.4471.786. PMID 17739548. ^ a b c d "Gazetteer of Planetary Nomenclature". Working Group for Planetary System Nomenclature (WGPSN). U.S. Geological Survey. 7 November 2008. Retrieved 2 August 2008. ^ a b c d e Sheppard, Scott S.; Jewitt, David C. (5 May 2003). "An abundant population of small irregular satellites around Jupiter". Nature. 423 (6937): 261–263. Bibcode:2003Natur.423..261S. doi:10.1038/nature01584. PMID 12748634. ^ a b Williams, Matt (14 September 2015). "How Many Moons Does Jupiter Have? - Universe Today". Universe Today. Retrieved 18 July 2018. ^ Bennett, Jay (13 June 2017). "Jupiter Officially Has Two More Moons". Popular Mechanics. Retrieved 18 July 2018. ^ Resnick, Brian (17 July 2018). "Astronomers discovered 10 new moons of Jupiter. Where have they been hiding?". Vox. Retrieved 18 July 2018. ^ Science, Carnegie (16 July 2018). "A dozen new moons of Jupiter discovered, including one "oddball"". Carnegie Institution for Science. Retrieved 18 July 2018. ^ Sample, Ian (17 July 2018). "Astronomers discover 12 new moons orbiting Jupiter - one on collision course with the others". the Guardian. Retrieved 18 July 2018. ^ a b Marazzini, C. (2005). "The names of the satellites of Jupiter: from Galileo to Simon Marius". Lettere Italiane (in Italian). 57 (3): 391–407. ^ Marazzini, Claudio (2005). "I nomi dei satelliti di Giove: da Galileo a Simon Marius (The names of the satellites of Jupiter: from Galileo to Simon Marius)". Lettere Italiane. 57 (3): 391–407. ^ Nicholson, Seth Barnes (April 1939). "The Satellites of Jupiter". Publications of the Astronomical Society of the Pacific. 51 (300): 85–94. Bibcode:1939PASP...51...85N. doi:10.1086/125010. ^ Payne-Gaposchkin, Cecilia; Haramundanis, Katherine (1970). Introduction to Astronomy. Englewood Cliffs, N.J.: Prentice-Hall. ISBN 0-13-478107-4. ^ a b Marsden, Brian G. (3 October 1975). "Satellites of Jupiter". IAU Circular. 2846. Retrieved 8 January 2011. ^ Anderson, J.D. ; Johnson, T.V. ; Shubert, G.; et al. (2005). "Amalthea's Density Is Less Than That of Water". Science. 308 (5726): 1291–1293. Bibcode:2005Sci...308.1291A. doi:10.1126/science.1110422. PMID 15919987. ^ Burns, J.A. ; Simonelli, D. P.; Showalter, M.R. ; et al. (2004). "Jupiter's Ring-Moon System". In Bagenal, F.; Dowling, T.E. ; McKinnon, W.B. (eds.). Jupiter: The Planet, Satellites and Magnetosphere. Cambridge University Press. ^ Burns, J. A.; Showalter, M. R.; Hamilton, D. P.; et al. (1999). "The Formation of Jupiter's Faint Rings". Science. 284 (5417): 1146–1150. Bibcode:1999Sci...284.1146B. doi:10.1126/science.284.5417.1146. PMID 10325220. ^ a b c d e Scott S. Sheppard. "Jupiter's Known Satellites". Departament of Terrestrial Magnetism at Carniege Institution for science. Retrieved 17 July 2018. ^ Sheppard, Scott S.; Jewitt, David C.; Porco, Carolyn (2004). "Jupiter's outer satellites and Trojans". In Fran Bagenal; Timothy E. Dowling; William B. McKinnon (eds.). Jupiter. The planet, satellites and magnetosphere (PDF). Cambridge planetary science. 1. Cambridge, UK: Cambridge University Press. pp. 263–280. ISBN 0-521-81808-7. Archived from the original (PDF) on 26 March 2009. ^ Strickland, Ashley. "12 new moons discovered around Jupiter". CNN International. CNN. Retrieved 17 July 2018. ^ Nesvorný, David; Beaugé, Cristian; Dones, Luke (2004). "Collisional Origin of Families of Irregular Satellites" (PDF). The Astronomical Journal. 127 (3): 1768–1783. Bibcode:2004AJ....127.1768N. doi:10.1086/382099. ^ "Amalthea - definition of Amalthea in English from the Oxford dictionary". OxfordDictionaries.com. Retrieved 20 January 2016. ^ a b c d Siedelmann P.K. ; Abalakin V.K. ; Bursa, M.; Davies, M.E. ; et al. (2000). The Planets and Satellites 2000 (Report). IAU/IAG Working Group on Cartographic Coordinates and Rotational Elements of the Planets and Satellites. Retrieved 31 August 2008. ^ "Europa - definition of Europa in English from the Oxford dictionary". OxfordDictionaries.com. Retrieved 20 January 2016. ^ "Ganymede - definition of Ganymede in English from the Oxford dictionary". OxfordDictionaries.com. Retrieved 20 January 2016. ^ a b c d Gray, Bill. "Pseudo-MPEC for S/2003 J 12". projectpluto.com. Retrieved 18 July 2018. ^ a b c d Gray, Bill. "Pseudo-MPEC for S/2003 J 10". projectpluto.com. Retrieved 18 July 2018. ^ a b c d Gray, Bill. "Pseudo-MPEC for S/2003 J 4". projectpluto.com. Retrieved 18 July 2018. ^ a b c d Bill, Gray. "Pseudo-MPEC for S/2003 J 2". projectpluto.com. Retrieved 18 July 2018. David Perlman (15 May 2003). "43 more moons orbiting Jupiter". San Francisco Chronicle.